Another retro game chosen pretty much at random today, but Ranma 1/2 is leagues ahead of Running Battle, despite not being all that fantastic itself. It’s a one-on-one fighting game, and clearly doesn’t have the depth of anything like Street Fighter II, or even Fatal Fury. You’ve four buttons, light and heavy attacks, jump, and block. Pressing both attack buttons together performs a special move, which for Ranma himself (who I played as) is some sort of whirlwind thing which rarely did anything useful. Since I know a little of the original Ranma 1/2 story, having characters I knew elevated it a bit higher than other similar games from the same era. Each foe required different tactics to beat as well, which made it more interesting but looking at it now it seems this was to replace proper reactive AI. 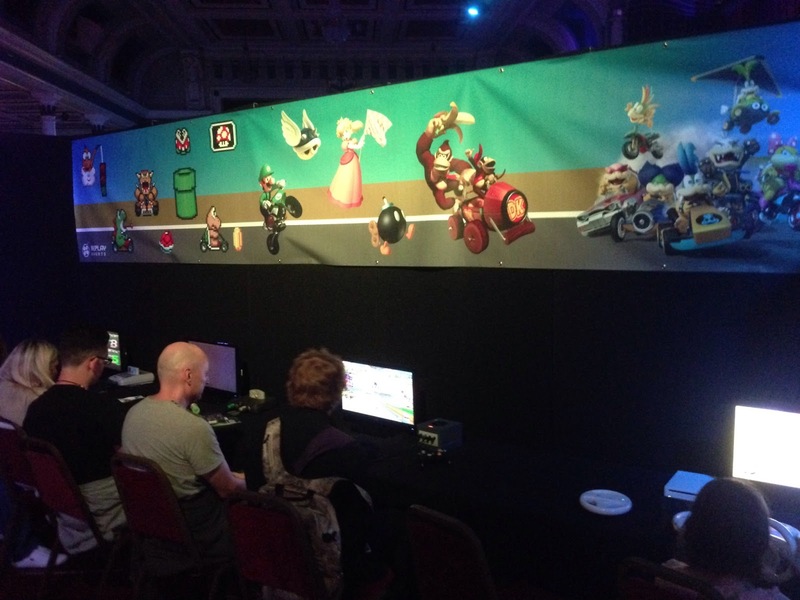 I can see it being a lot more fun in two player mode. In single player though, it was far too easy (I didn’t lose a single round) and so over too quickly. A lack of moves is a minus as well, although since I had no instructions it’s possible there were a load I just didn’t figure out, despite trying Street Fighter and Mortal Kombat style control acrobatics. Perhaps the most amazing thing about the game is that it came out in the west, as it’s just about the most Japanese thing ever. Mind you, Goeman did too, so who knows. The post Ranma 1/2 (SNES): COMPLETED! 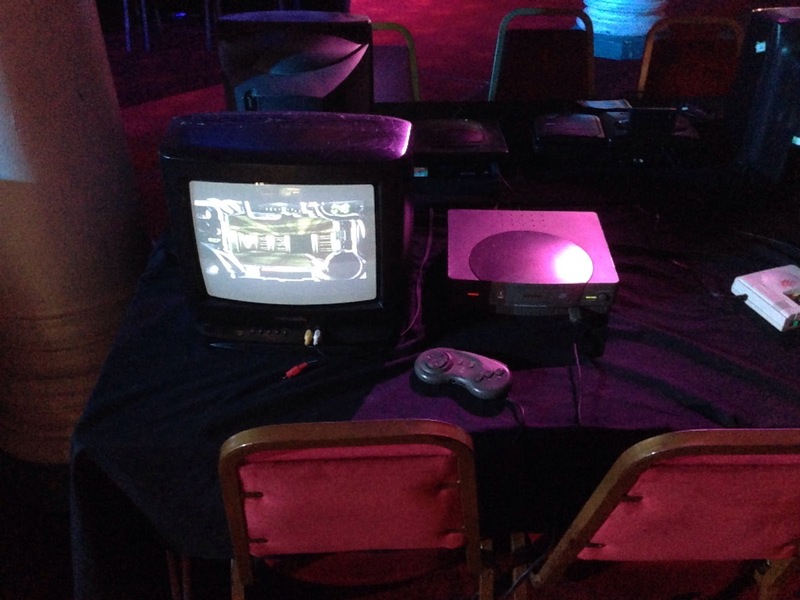 appeared first on deKay's Gaming Diary. I've been fiddling with the emulators on the Wii recently and have finally managed to get them in a state where they're easy enough to use. I've also been experimenting with ROMs I've picked up. The joys of being an adult and being interested in retro games is that many of the cartridges you long after when you're young can be had for a pittance when you're older - and you have the money to spend on them as well. The disadvantage is having space to store them and the machines. I've been buying various cart games off eBay for years, but often these have sat unplayed because my Mega Drive, Master System Converter, Game Gear, and so on, are all in the loft. This emulation gives me a handy way of playing the games - and, of course, adding features such as save states and allowing me to run it through my video capture box. It's not as good as using original hardware, due to the controllers, the lack of a clunk as the cartridge engages, and some emulation oddities, but it'll do. 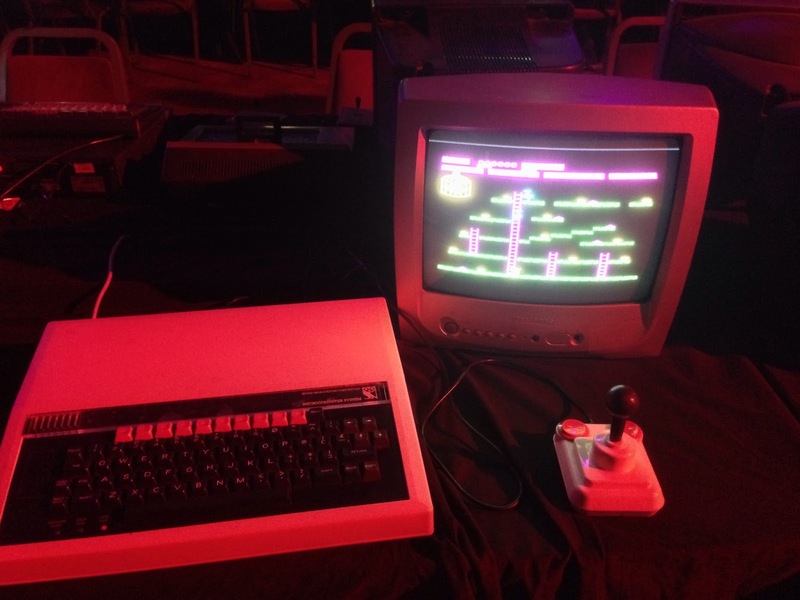 The other benefit is that I get to try out some of the games I never played when I was young. I've never owned a SNES, though have played many of the games through Virtual Console or other rereleases. One day I will get a second-hand console, but until then this is ideal. Anyway. 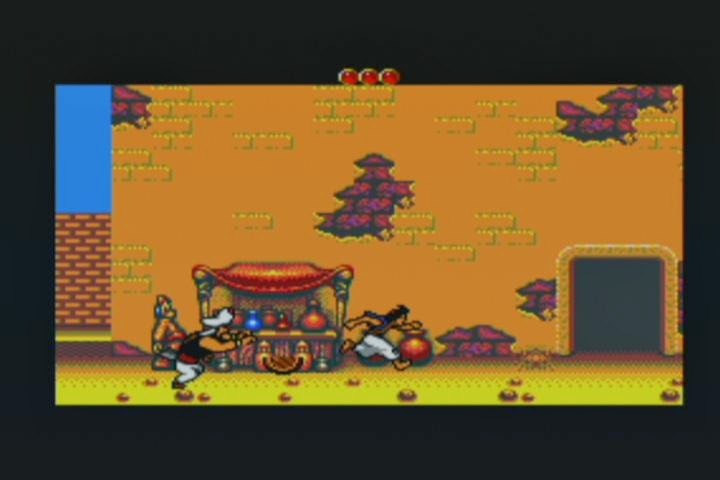 When setting the emulators up, the first game I wanted to try was the Mega Drive version of Aladdin. This was always one of my favourite games when I was young, and I was great at it - making it all the way through without losing a life or even throwing any apples. I thought that at the same time, I should try the SNES game, which was made by a completely different company, and also try the Master System and Game Gear games, which I own on cartridge but have never played. I immediately noticed that the game felt faster, which probably means that the 50Hz conversion wasn't entirely optimised. Having said that, the difference felt marginal, and if anything controls felt a little less defined than I remember. I last played the game on the Mega Drive about four years ago, so it may be a memory trick. 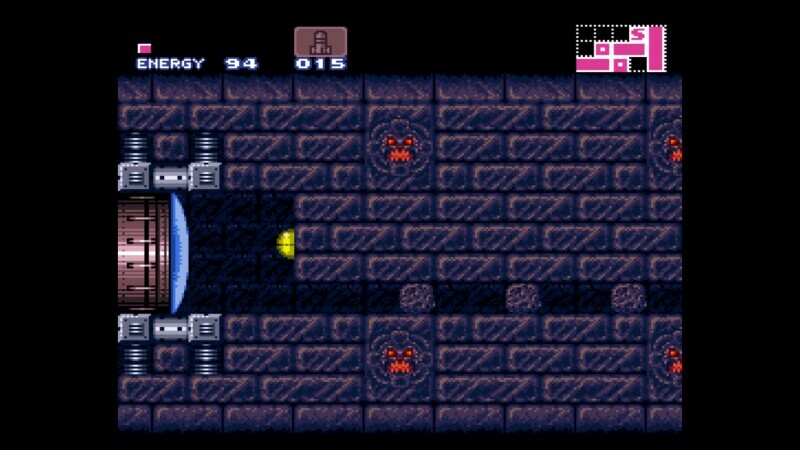 I ran through the first level with ease; I can remember ever jump, every enemy, every secret. I lost a life on purpose just before the end of the level since I couldn't remember what happened - the genie int eh boxing ring. 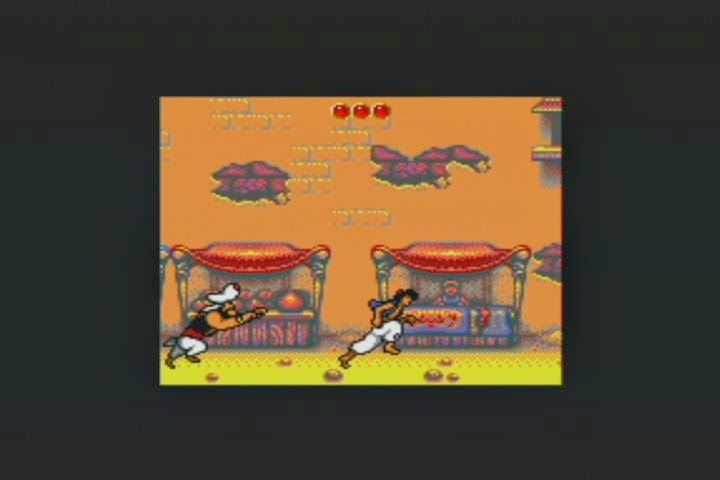 I picked up the golden Abu and completed the bonus stage. I played halfway through the desert before deciding that I ought to get on with one of the other versions, rather than spend the entire day playing this again. It's still an amazing game, one of my favourites of all time, and I will play it again soon even if only to get to the rug ride stage. 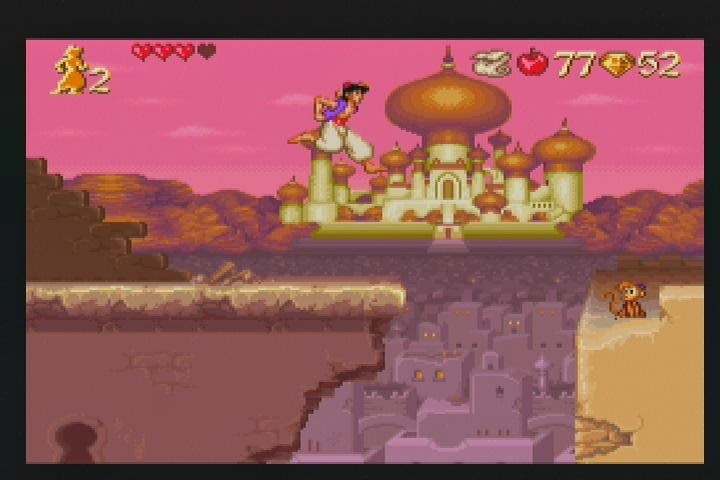 It certainly looks nice, though the animation on Aladdin feels a bit off - his running animation isn't quite at the same speed as he moves. 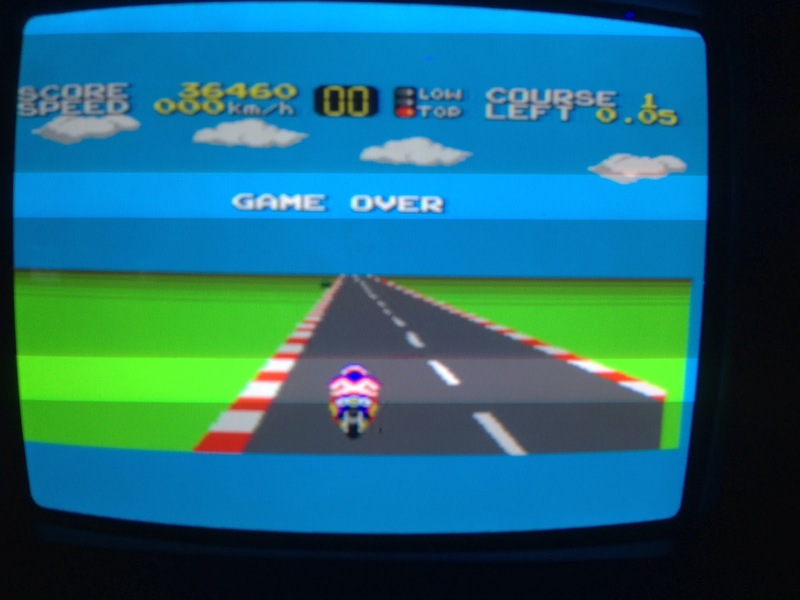 And the controls feel a bit off as well, though this may be due to the emulation. I went in expecting a bit of a rubbish game, because I've always been told it's not as good as the Mega Drive game ... and while it's definitely inferior, it's actually pretty good anyway. You don't feel as free and athletic running through the streets, there isn't the same sense of scale and exploration, and it's doesn't make you smile as much when dispatching enemies. It's still fun. I wasn't sure what to expect from this. I've never heard much about it at all, other than how great it looks. And you know, it does look pretty amazing. Obviously it suffers from direct comparisons to the Mega Drive game, but the animation is still top-notch, and it's vibrant and colourful. What really surprised me was the complete difference in game style. 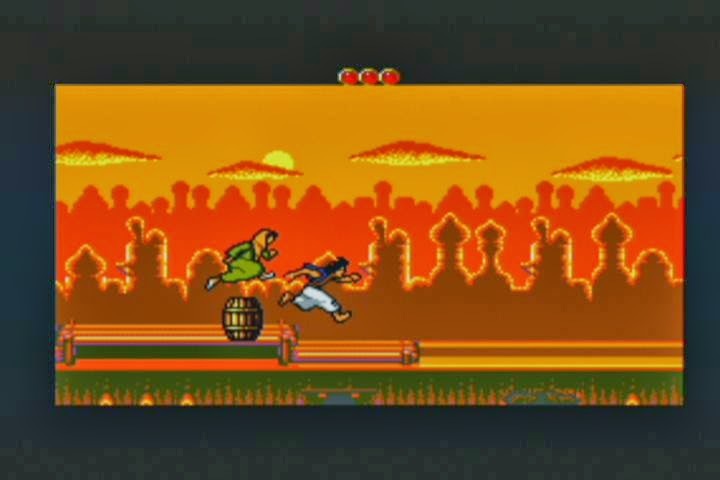 This is more like the endless runners that are now popular on the App Store, except with an end point. 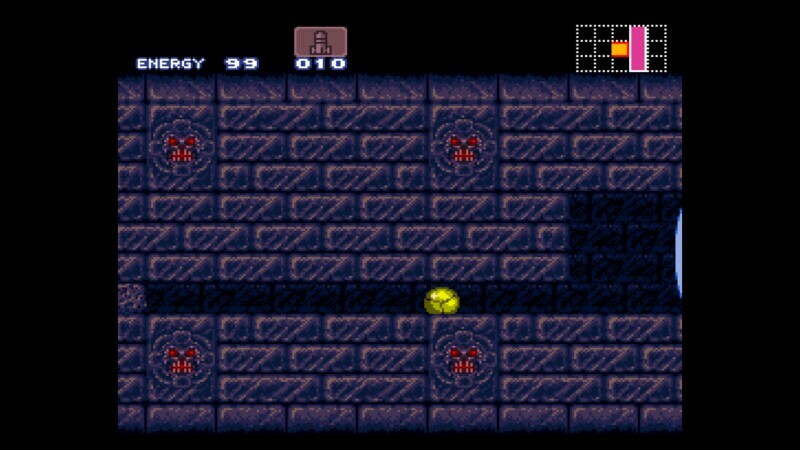 The screen constantly scrolls, and you have to jump obstacles and avoid enemies in order to not get caught behind. At first it's quite tricky, but you soon learn the level and can breeze through it. 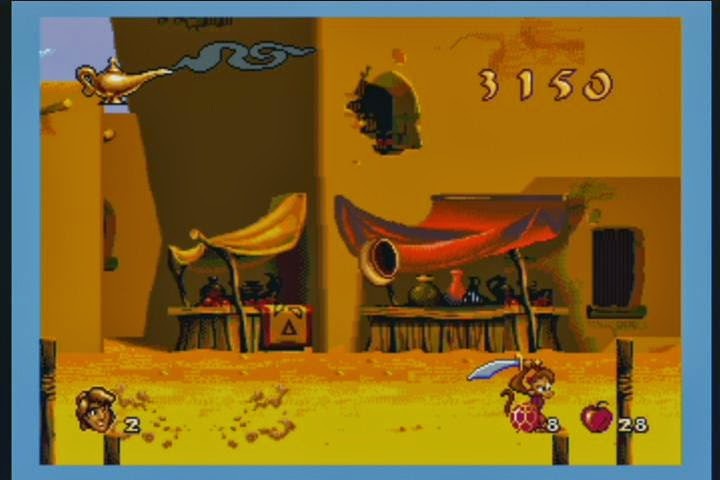 The backgrounds are impressively drawn and the game moves at a fair pace. 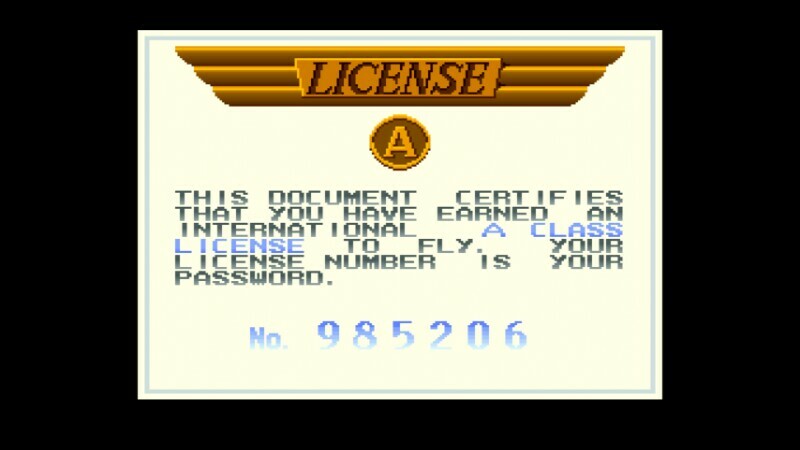 I only completed the first two levels, but I will be back for the rest at some point - I do own the cartridge, so it'll be interesting to see how it plays on original hardware. 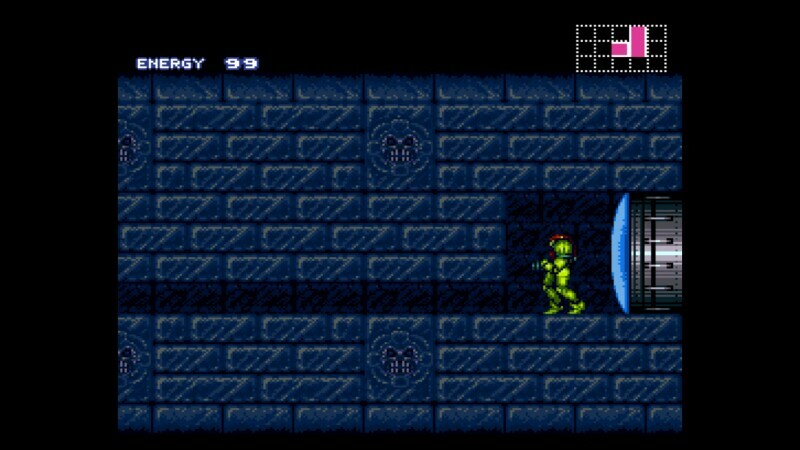 As with most games of the time, the Game Gear version is just a port of the Master System game, with a reduced window and slightly brighter graphics. 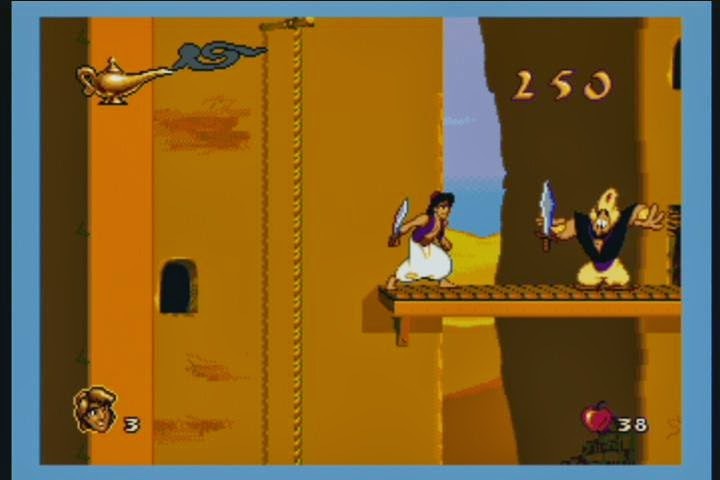 This makes the game a lot harder, as obstacles appear in front of Aladdin with much less notice. It was no doubt great for anyone without other versions to compare it to, but against the Master System game it just seems unfair. This is possibly the first time I've found the difference between 50Hz and 60Hz to have a significant impact on a game. 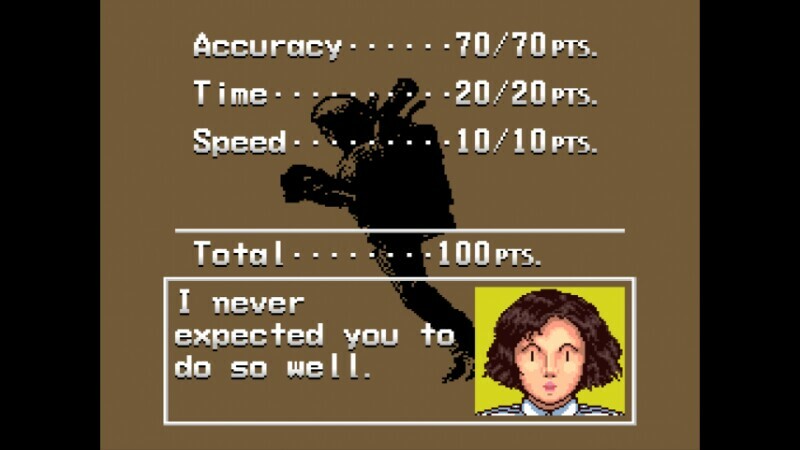 When I tried to play Pilotwings previously, I found that I was constantly fighting with the controls and didn't enjoy it. Amusingly, I forecast at the time that I'd go back to the game "in a couple of years". On the Wii U, it's the 60Hz version, and it feels much more responsive. 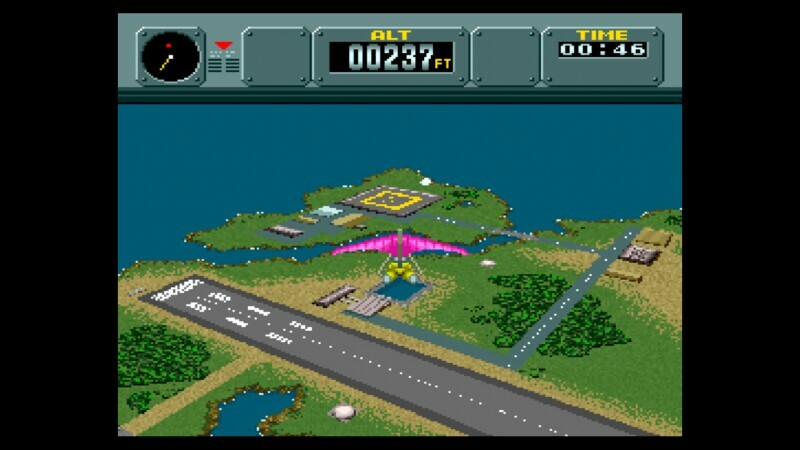 I still found control of the skydiver quite tricky, as it's difficult to see how to move forwards and keep a good speed, but the rocketpack was much easier to deal with. My other main complaint previously was the difficulty in judging distances, and in particular how quickly you can descend to land. I think that this simply requires a lot of practice, but the game doesn't let you repeat just one mission as far as I can see. It looks like the landing zone is miles away here, but to get there requires a lot of diving and pushing the nose down, which of course then means you're going too fast to land. I shall have to work out how to do this more consistently. 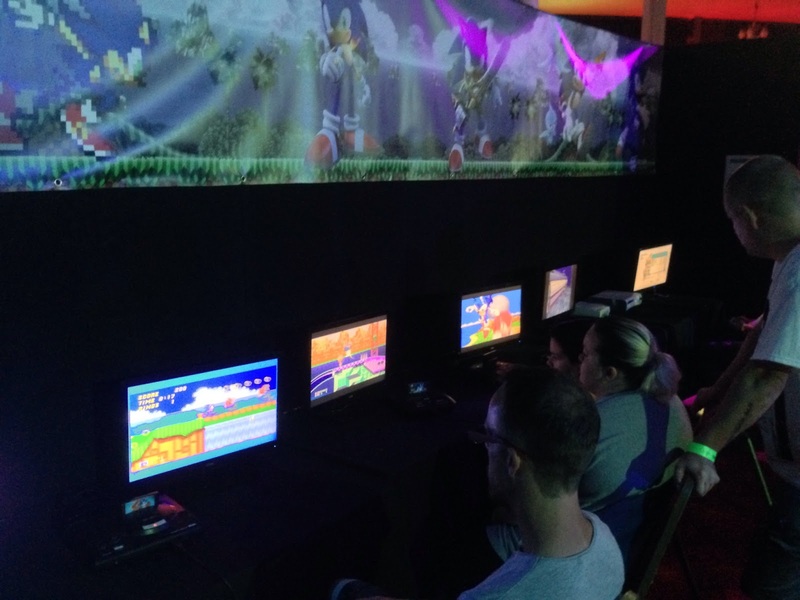 I played Super Mario Advance 2, but never got that far - which is surprising. 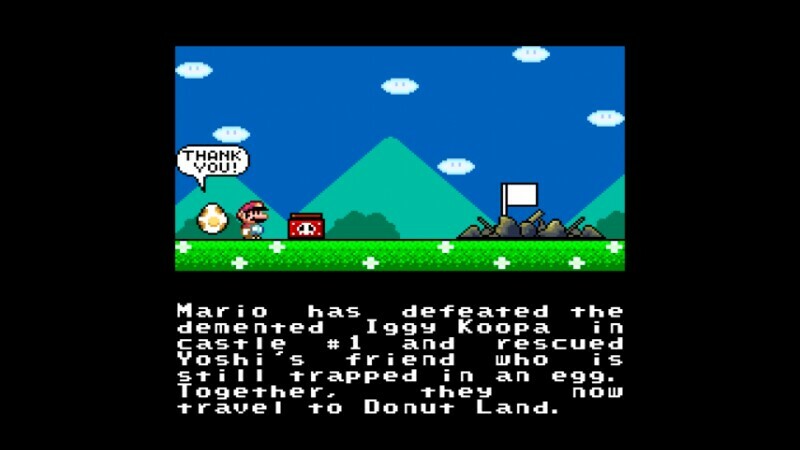 I played the Wii VC version of the game for a bit, but stopped for some reason after passing Donut Plains. Now I've upgraded that to the Wii U VC version, I'm going to try to complete a game which many hail as the best of all time, but I've only scratched the surface of. Yes, I know. I'm still halfway through NSMBW and NSMBU. Shh. Initial impressions aren't great. The text is really hard to read - had Nintendo never heard of kerning? 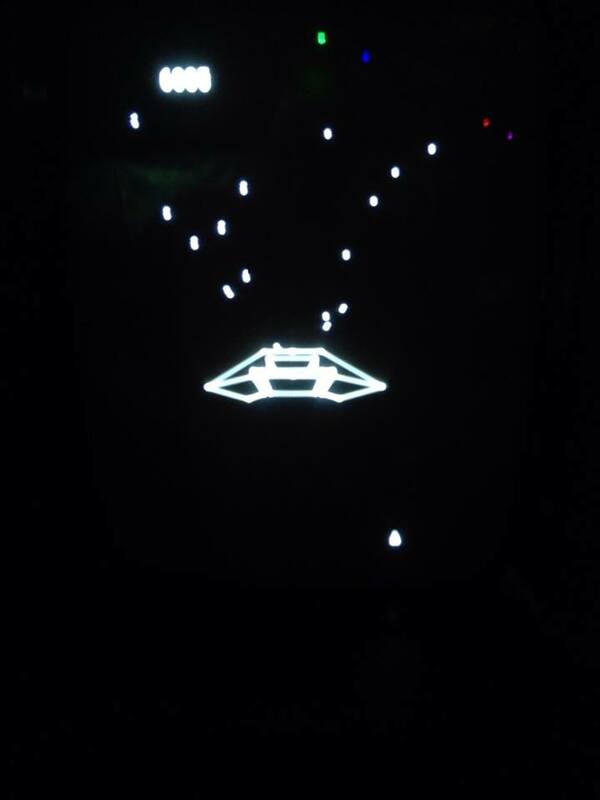 - and the controls feel a bit imprecise. This may be because of the travel on the buttons on the Wii gamepad, and the use of the analogue stick. In any case, after a while the controls weren't an issue. 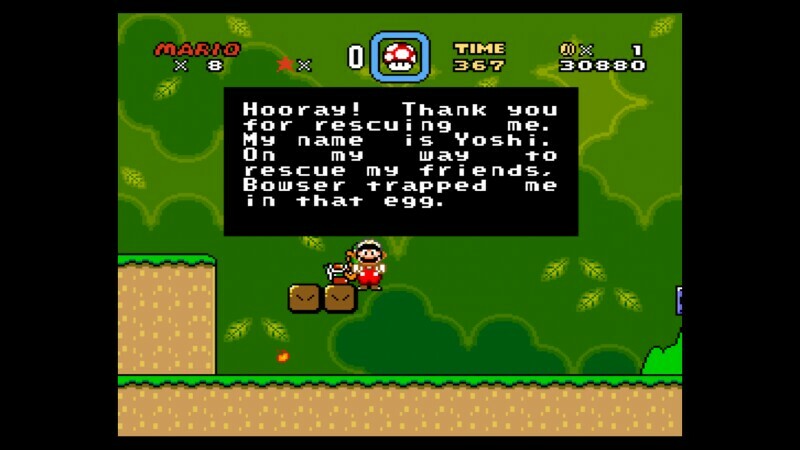 In this screen, you can see Mario rescuing Yoshi. 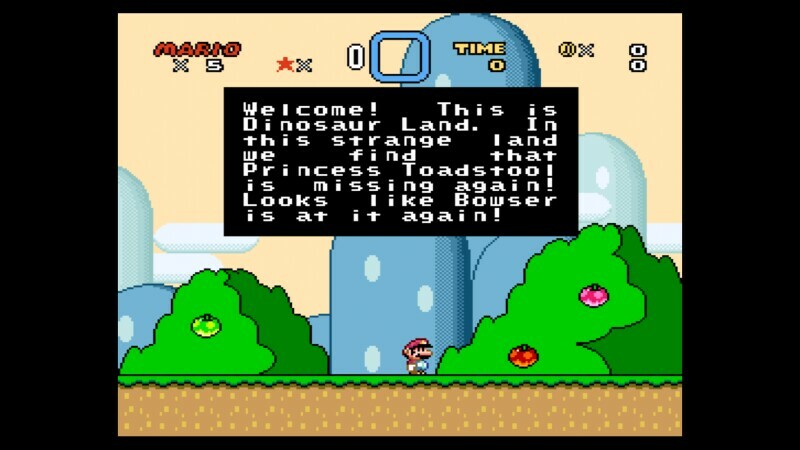 Two things to note here: Mario seems to be able to float in mid air, and Yoshi is singularly useless, getting captured around 100 metres from his home. It hardly seems worth the effort. I completed the first set of levels pretty quickly, and then got stuck on the first level where you can collect the feather that turns into a cape. That cost me three lives, because I kept expecting Yoshi to be able to swallow the baseballs lobbed at him. 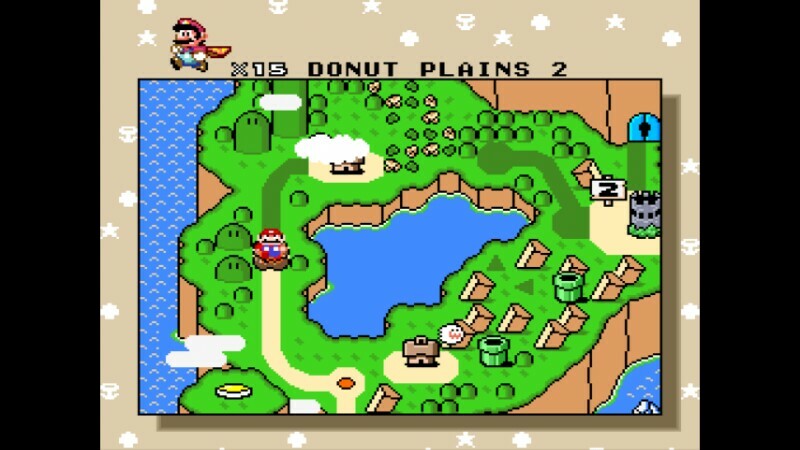 I finished at the second level in Donut Plains, annoyed with the red dot indicating that there's a secret exit on the first level. I know how to get to it - you need the green switch palace - but I hate leaving it blinking there. I've been waiting for this to be on special offer since I got my Wii U. 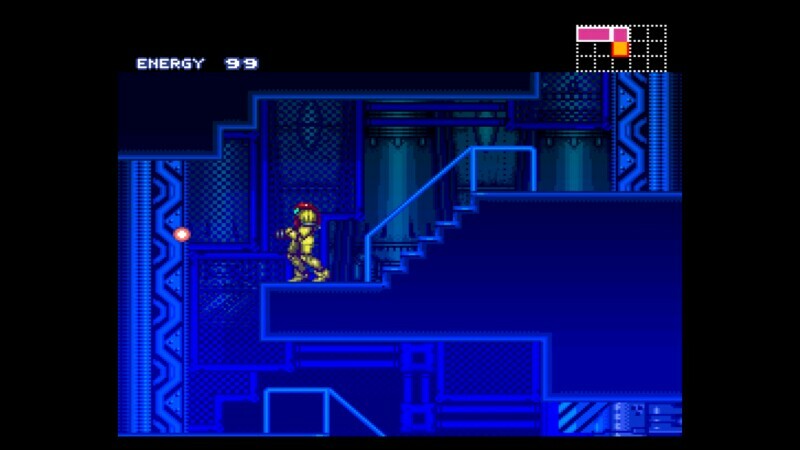 The first Metroid game I played was Fusion on the GBA, which pre-dated this blog. 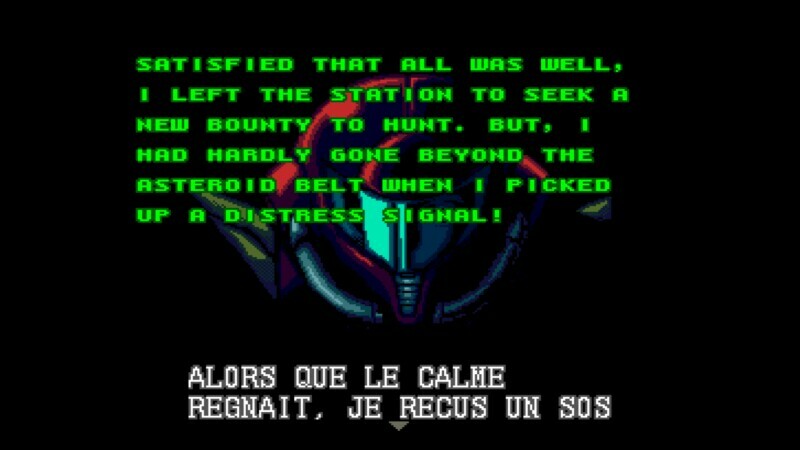 Metroid Zero Mission was completed in 2005, after an intensive playing time. I've since wanted more of the 2D games, but there wasn't an easy way to get either the second game or Super Metroid - I have a feeling that the latter may have been on the Wii Virtual Console but I never thought to look there. Anyway, I've started this now. Oh no! 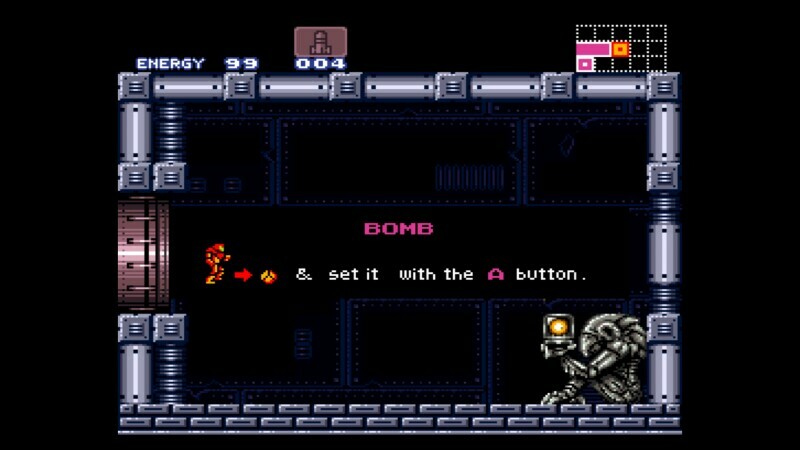 And that's where the last Metroid is! I'd better go back! 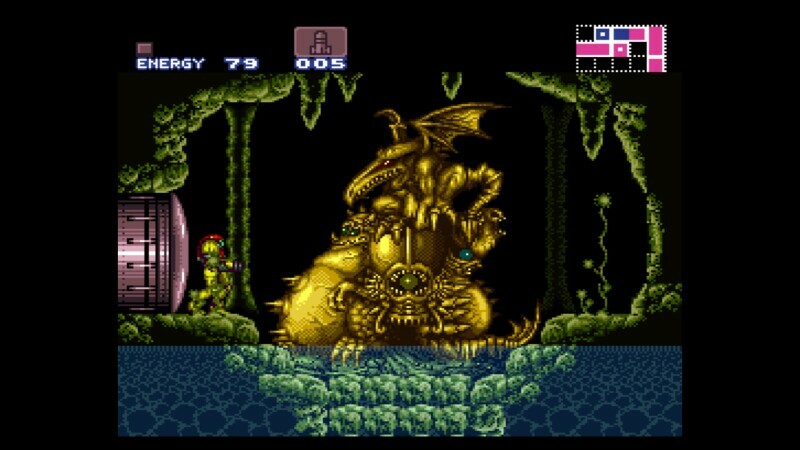 Eventually I got through to the end of the space station, where a big bird thing stole the Metroid and fought me. I was massively underpowered and nearly died - but luckily the enemy scarpered before I died. Arriving on the planet, I descended down a shaft until I found a blue door. Going through ... and I could go no further. Huh. 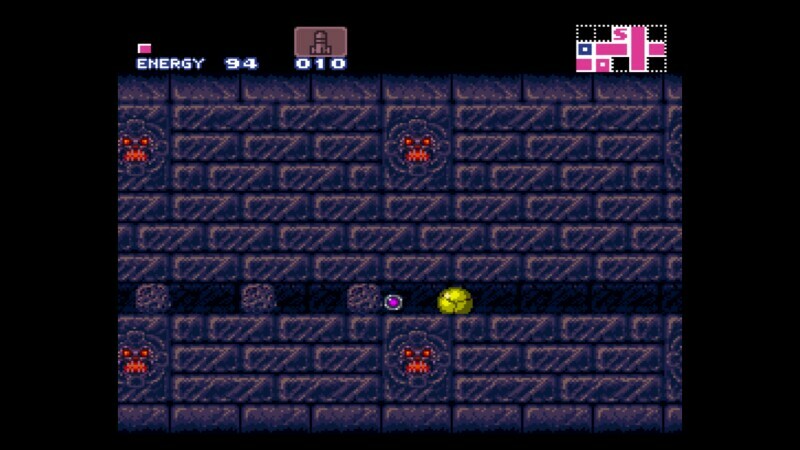 After a bit of exploration, I finally found the morph ball, meaning I could go through the tunnel. A little way. There was a block just a way down a tunnel. This meant I could go through the tunnel at last. 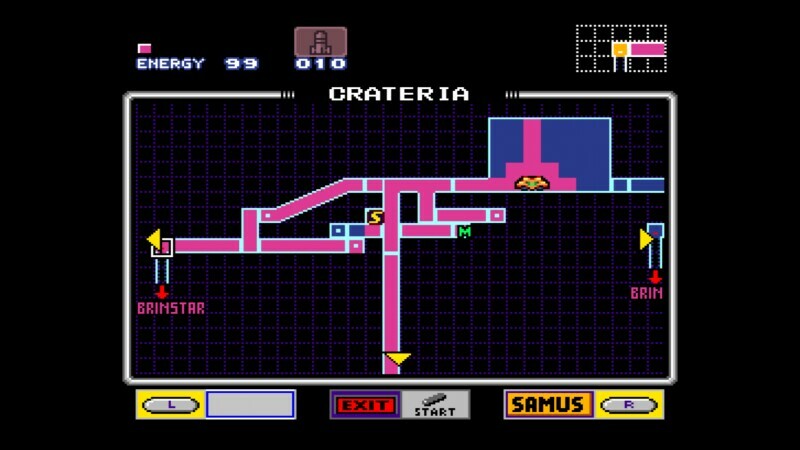 There wasn't much at the end (a bunch of missiles), but at least on the way back I could take a shortcut. At least I have a few upgrades now, but I still feel pretty underpowered - so walking into this room I was rather apprehensive. Luckily it appears to be a statue, or at least it is at the moment. I found another lift down, but I didn't want to go down until I'd coloured in the blue.